Seamus Heaney and the bog people. , containing photos of Tollund Man. I wish I could link to the actual podcast, but the BBC doesn’t keep them online more than a week or two, and it was originally posted in early December. I haven’t read any of Heaney’s poetry before, but the sound of his voice reading “Punishment”, linking the treatment of women who dated British soldiers in Northern Ireland in the early 70s to the bog bodies, some of which were murdered and buried in the bog. His voice just pierced me. Walking through the quiet snow-covered city streets with these images of hatred, revenge, and death was a very powerful experience. 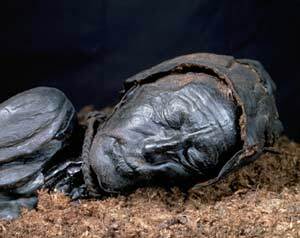 I would very much like to own an audio recording of some of his poetry, and read more about these bog bodies that so inspired him. Try to read this and not be moved.